Don't you guys all want to paint your front door yellow now?! Or even the green that Kristen had before the yellow?! I love them both and I am inspired to paint mine something fun. Maybe next week, when I will be kid free a few days a week! My girls start school next week and it's bittersweet. I am sad that summer is over but kind of ecstatic about having some me time. Going to the grocery store kid free makes me oh so happy. 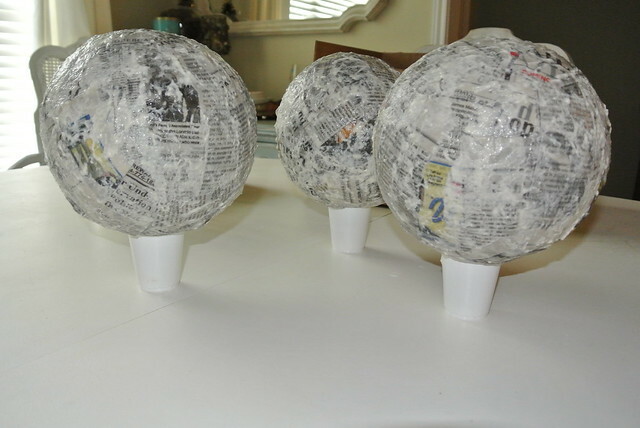 We have had some fun with paper mache balloons this week. 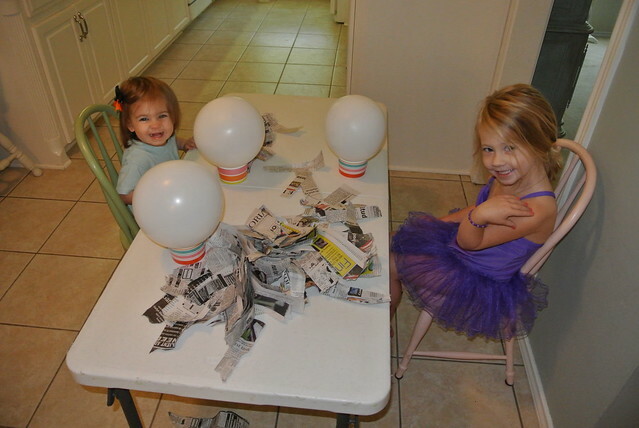 The project is still in the works, they are going to be pumpkins. If Hobby Lobby already has Christmas trees up, there is no shame about making pumpkins in August. 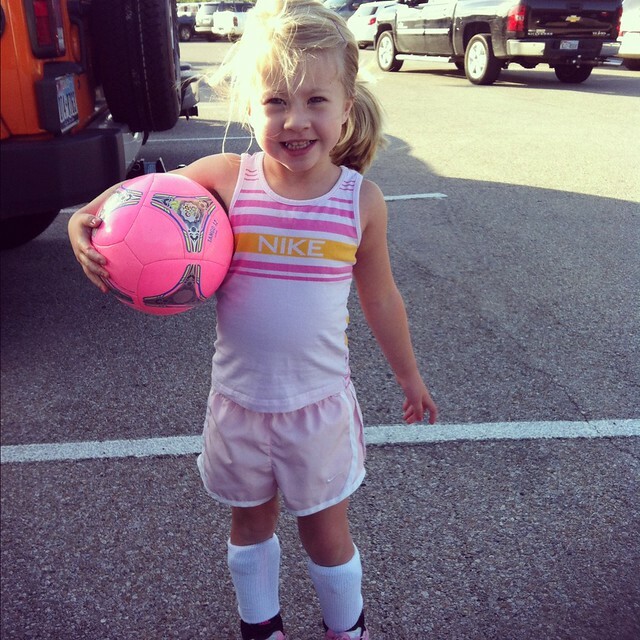 Ella started soccer practice this week! She was so excited about it! I was so excited! Until we tried on her shine guards, socks and cleats last week. It was dramatic to say the least. Ella is a girly girl and has an eye for fashion. 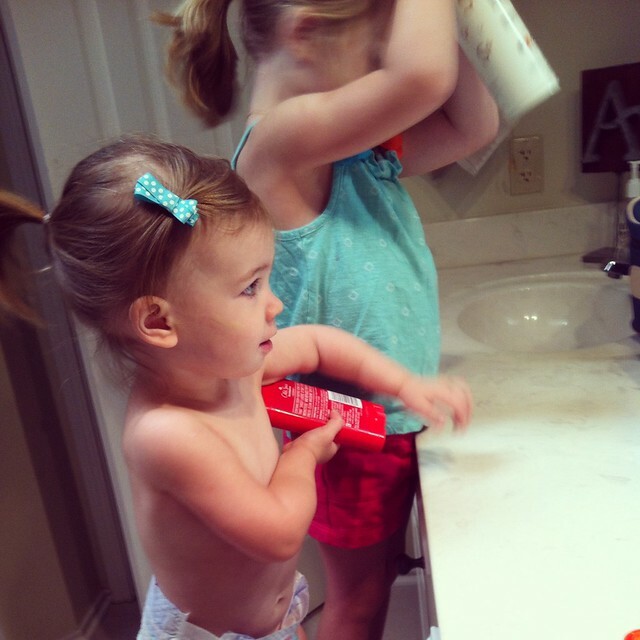 Sometimes getting dressed takes 30 minutes because she changes clothes so many times. I love that she has her own style and enjoys putting outfits together but I always remind her that it's not about how we look on the outside but how beautiful our heart is on the inside. I understand that she is only 4 years old and it's ok that she wants to change dresses 10 times a day. But when she couldn't go kick the soccer ball in the front yard because her shorts looked funny with her shine guards and socks I was a little worried. Ella was so excited to show Bob her new soccer gear last week and as soon as he got home from work he put on his shine guards and cleats to practice with Ella. She was thrilled! Then she stood up and looked down at her legs and lost it. She switched shorts 3 times and then just laid on the floor in tears. Bob and I had no idea what to do. We tried to pep her up and encourage her but she couldn't get over it. After a long time of tears, talks and time outs, Bob took his gear off and we called it a day. I never tried again with the soccer stuff until her first practice last night. I brought the cleats, socks and shine guards with us and didn't put them on till we got to practice. I was hoping that once she saw everyone else wearing them, she wouldn't think twice about it. She was such a great sport! I could tell as I was putting them on her that she was thinking twice but she didn't say a negative word about it. She walked on the field like she was a pro and did awesome! She loved it! I am so proud of her and can't wait for the first game. I will leave you with my new favorite picture of McKenna. Ahhh! That girl cracks me up!